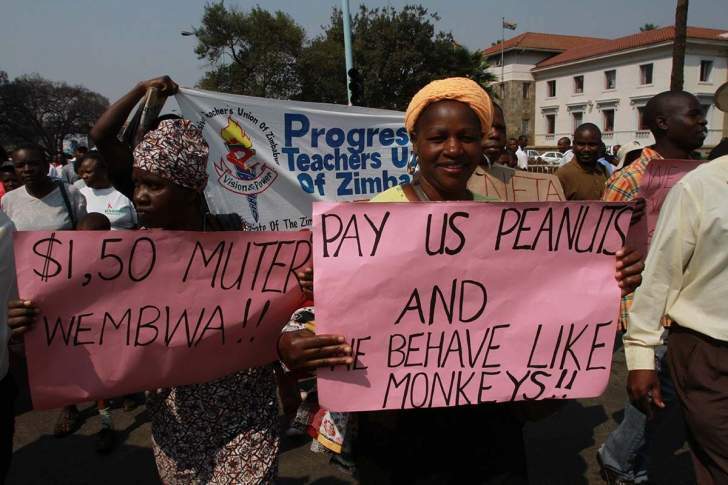 The Amalgamated Rural Teachers Union of Zimbabwe (Artuz) has resolved to embark on fresh protests at Public Service Commission district offices to push for the reversal of deductions made on leave days for its members who participated in a recent job action. The resolution was arrived at the union's national executive council (Nec) meeting held in Chitungwiza at the weekend. Artuz president Obert Masaraure said the protests have been necessitated by the failure by the PSC to meet the March 4 deadline to reverse the government position on deducting leave days for 10 200 teachers who participated in past job strikes to push for better wages and working conditions. "We agreed with the PSC to have the position on leave days that were deducted on 10 200 teachers, who participated in our past job action, to be reversed by March 4. Now that the PSC has failed to meet that deadline, we are going to protest at their district offices countrywide, starting on a date to be advised very soon. That was the resolution made at the March 10 Nec meeting of Artuz," he said. Part of the minutes of the union's executive meeting also indicate that there was growing concern over the deteriorating living conditions of teachers due to the worsening economic situation. "Teachers' salaries have been heavily eroded and the majority of them are now trapped in debt. The government is using the "no work no pay principle" to instil fear among teachers and avert future job actions," read the minutes. The Artuz leadership also bemoaned the State's heavy-handedness when dealing with labour issues of teachers in rural areas. "The State is determined to annihilate Artuz through the use of propaganda and force. Teachers are panicking after a wave of gross human rights violations including abductions, torture, unlawful arrests, displacement, militarisation of schools and the ongoing deduction of leave days. Democratic space is being closed in Zimbabwe by the current government." Masaraure said the Artuz leadership had made a number of resolutions at the meeting to address challenges being faced by the rural teachers. The union also wants its members to decide on the recently announced Teaching Professional Council largely seen as a move to gag them. "The Nec, therefore, resolved to ensure that the ongoing sit-in by teachers be sustained until we receive a living wage. The union will build momentum towards a crippling job action to demand a living wage. "Again Artuz will conduct a referendum on the Teaching Professional Council in which teachers will vote for or against the TPC. The TPC should be a democratic institution for the teachers by the teachers," Masaraure said. Education minister Paul Mavima was unreachable when sought for comment, but he has previously indicated that government was serious in its drive to address all grievances put forward by teachers.